For Christmas my wonderful partner bought me the big pack of Prisma Colour pencils - yes the whole set! And I keep opening them, gazing in adoration at them then closing the box. So I decided I better acutally use them as that is what they are for. Sharpening that first pencil is always the hardest, just like cutting that first piece of cardstock, or fabric, it is so pristine and you don't want to stuff it up - lol. Anyway, I stamped this cute little birthday chick image and started to colour and layer and colour. 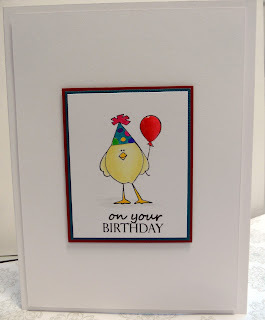 I used glossy accents on the ballon, and the sentiment is from a Papertrey Ink set.